Sunday’s “60 Minutes” interview with Steve Bannon provided the most insightful education on American politics in years. What is most significant about the interview is not so much what Bannon said, but what was behind what he said; what he didn’t say; and how Charlie Rose utterly embarrassed himself and demonstrated (again) that the media cannot be trusted. Right off the bat, viewers were schooled because Bannon defied expectations. Those who don’t know him assumed he’d savage the Left on national television. Instead, he went after the real threat to Trump’s presidency – the Republican Establishment. The Left isn’t a threat. The Democrats and the Left have become a laughingstock. As they lurch from outrage to outrage, always screaming, always with the hyperbole that is the hallmark of Trump Derangement Syndrome, normal Americans tuned out long ago. Democrats were soundly pummeled in 2016, and they still don’t get why. Bannon wants McConnell out. He wants Ryan out. Because they are inhibiting the one thing President Trump needs to move America forward – improve the economy. 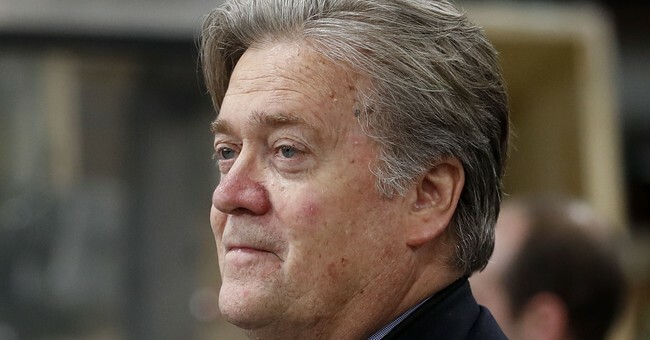 All Trump has to do, Bannon said, is do what Trump said he would do, and re-election is assured. The reason Trump’s approval ratings are so low is that he hasn’t accomplished any of these things, and much of it has to do with the Establishment’s blockade. Moreover, Bannon astutely says that it is also the Democratic Establishment that stands in the way of that party moving forward. His best quote of the evening was that Bernie Sanders had the Democratic Establishment, and Hillary Clinton nailed, regarding how the Wall Street power structure controls the party, but Sanders couldn’t close the deal. That’s partially due to the corrupt party structure of “super-delegates,” a system designed to keep the Establishment in power. He even complimented Chuck Schumer and Sherrod Brown, saying that even they understood that the party had to move away from identity politics. Then, for every unsophisticated goon who thinks that the only way to solve the North Korea problem – a problem resulting from twenty years of appeasement and extortion – is military action, Bannon rightly points out that the key to North Korea is China. We are not at economic war with China, but China is at economic war with the United States. Now, want an understanding of how the story is never the story? Look what Bannon did when the distasteful revelations of Trump’s locker room talk regarding women were released. He knew it was a non-story as far as the electorate was concerned. He knew Trump voters and fence-sitters didn’t care, that what they cared about was economic prosperity. Instead, he used it to see who was truly on the Trump team, who understood that Trump was a pugilist and not a cowering political hack. He found out. Billy Bush? Chris Christie? Buh-bye. Then we have Charlie McBabble Rose. I’m sure some tuned in hoping to see Rose go after Bannon. Partisans probably think Rose did a great job, which only further demonstrates the lack of political sophistication of the Left. Yet Bannon snatched up Rose’s fumble and returned it for a touchdown. Rose gave Bannon the perfect opportunity to (again) openly condemn the neo-Nazis that were in Charlottesville (and thereby acquit himself), but remind viewers that Trump has repeatedly disavowed Duke. Rose, who has been doing this job so long that he’s about to turn to dust, engaged in foolish partisan grandstanding – and revealed himself to be the media hack he is. He did more to discredit himself, and the media, than Bannon did – even with his worst answers. What does Trump say? What anyone limited to 140 characters says: simple, plain language, emotional statements designed to reach the hearts of the average American. Only elitists think he’s saying no-good, awful, terrible things. Finally, if anyone checked out the online extension of the interview, Bannon openly condemns Trump for firing James Comey. It’s probably the smartest thing he said all night. Without a Comey firing, there is no Mueller investigation. Bannon recognizes Washington as a set of institutions and not people. You can change the institution of the Senate and House by replacing leadership, because Congress’ fundamental role is to govern, and anyone can govern. However, the FBI’s fundamental role as an institution is to investigate. Trump cannot change that by changing leadership. You can hate Steven Bannon all you want, but dismissing his wisdom as a political strategist is done at your own peril.